Chief city of Ireland. The Jewish community in Dublin is one of the oldest of those which have been founded in Great Britain since the Resettlement, having been established in the first half of the eighteenth century. In the year 1748 Michael Phillips acquired some freehold ground at Drumcondra, opposite Ballybough Bridge, which he presented to the Jews of Dublin for a cemetery. Some years later the Jews of Dublin sought pecuniaryassistance from their Polish and German coreligionists in London, for the purpose of building a wall round their cemetery. Their applications were refused, but they received the desired help from the Bevis Marks congregation, which, besides defraying the expenses of the work, sent an agent from London to supervise it. The title-deeds of the Dublin Jewish cemetery were then deposited at Bevis Marks, with the archives of which congregation they are still to be found. Toward the end of the eighteenth century (about 1791) the Dublin community worshiped in Marlborough street, "in the yard of the glass-works." But the congregation fell into decay, and its effects were seized and sold for rent. Two scrolls of the Law were, however, rescued, and for some time they remained in the possession of "the brothers Cohen." Other scrolls, which had been borrowed from the Bevis Marks congregation, appear to have been previously returned. The congregation was resuscitated in 1822, when the few remaining families joined to open a place of worship at 40 Stafford street, the residence of J. W. Cohen. 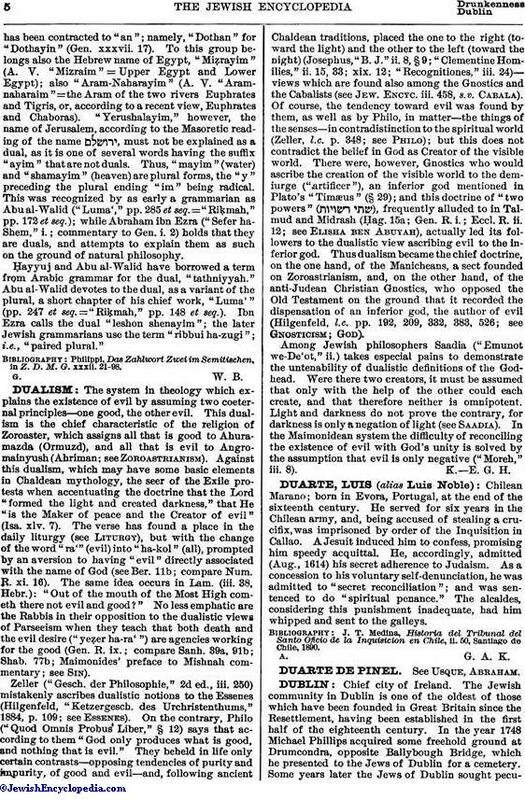 In 1829 this place of worship was enlarged, and about the same time "the brothers Cohen" presented to the congregation the two scrolls of the Law which they had rescued from the former building. Six years later the congregation removed to Mary's Abbey, where it had bought a meeting-house for £300. In 1842 the Mary's Abbey congregation expressed a wish to affiliate with the Portuguese Synagogue of London, but nothing appears to have resulted from the negotiations. Subsequently the congregation removed to their present building in Adelaide Road. In recent times, in addition to the principal synagogue in Adelaide Road, there have grown up a number of minor synagogues, or "ḥebrahs," of which at present there are five, situated respectively in St. Kevin's Parade, Camden street, Lennox street, Oakfield Place, and Lombard street. The principal ministers have been J. Sandheim, Philip Bender, and L. Mendelsohn. Other Jewish institutions are: the Board of Guardians (founded 1882), the Ladies' Benevolent Society, Hachnosath Orechim, and Medical Relief Society (founded 1888), and the National and Hebrew School (founded 1893), in Adelaide Road, which enrolls 160 scholars. The present Jewish population of Dublin is about 2,700. 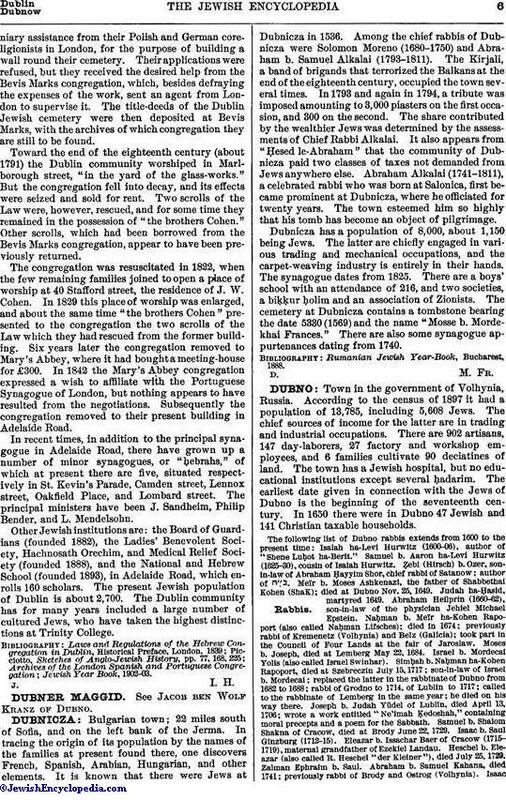 The Dublin community has for many years included a large number of cultured Jews, who have taken the highest distinctions at Trinity College.